Atlas and the Anchor: Fourth of July - "Before Our Hearts Explode!" 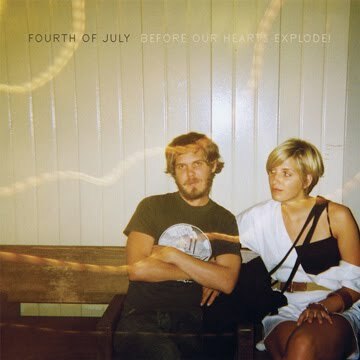 Fourth of July is set to release Before Our Hearts Explode!, their long-awaited sophomore album and follow up to their excellent debut, “On The Plains” today on Range life Records. The Lawrence, KS band are truly a band of brothers, with two sets, including Brendan Hangauer (vocals, guitars)and brothers Patrick (bass) and Kelly (keys, trumpet, vocals), along with Brian (drums, vocals) and Brendan Costello (guitar). And Adrianne Verhoeven, formerly of The Anniversary again lends her vocals to four of the tracks and Katlyn Conroy guests on two as well. Brendan’s easily relatable lyrics bite with the pains of relationships, the distances between and the little details of heartbreak with a conversational “everyman” quality similar to Tim Kasher from Cursive. “Friend of a Friend”, opens the album swirling with rumors of infidelities set to a cathartic soundtrack of trumpet, organ, and jangly guitar. “Bad Dreams (Are Only Dreams)” features a vocal trade-off with Katlyn with a clever twist of tempo for each vocalist on the standout track. “Providence” compares love lost to a murder with a trumpet melody as catchy as the melody it supports. The self-deprecating but earnest “I Don’t Want To Lose You” repeats the refrain “I don’t want to bore you at all” in the background with rootsy corn-fed instrumentation, including a twangy guitar solo. The up-tempo “Self-Sabotage” features a shuffling beat, a catchy keyboard melody and laid-back brotherly “la, la, la” harmonies for a barroom sing-along. The next track, “Song For Meghan” slows it back down with 50’s style doo-wop guitars and excellent harmonies from Adrienne in a song about long-distance relationships. “Tanlines” confronts a cheater with helplessness, a whistle solo and a rafters-reaching refrain for another standout moment. Owing as much to Bob Dylan and The Band as the Silver Jews, “L Train” is a great example of how the band’s ornate arrangements mirror Brendan’s observational lyrics. “Crying Shame” is amplified with unhinged guitars and vocals grounded by vocals by Katlyn and album closer, “Come Home” ends the album on an emotional note; tugging and pleading with a dissonant guitar solo that matches the strains of a relationship in its fleeting moments. Continuing the lyrical and musical theme set forth on their debut, Before Our Hearts Explode! is another great set of stories you can sign along to and does not disappoint.